Written by Amy Johnson and reproduced with permission. Everyone has a hobby. But not every hobby will allow you to take the scenic route across the country. Barry Hansen’s hobby is giving him an opportunity to drive across the United States: Seattle, Washington to Elizabeth City, North Carolina, to do exactly what he loves. While on her mail route last Monday morning, local mail carrier Stacey Painter came across Barry, who had his impressive radio set-up near Lila Heerten’s mailbox along rural dirt road 428th Avenue in western Keya Paha County. Backing up a bit, let’s explain what ham radio is. In a simple Google search, it explained that Amateur Radio (ham radio) is a popular hobby and service that brings people, electronics, and communication together. People use ham radio to talk across town, around the world, or even into space, all without the internet or cell phones. It’s fun, social, educational, and can be a lifeline during times of need. Now at age 63 and retired, Barry said that he’s been actively traveling and doing ham radio for the past ten years. “I’ve been to every location in Oregon and Washington states with my ham radio; going across the country intrigued me,” he shared. Prior to his cross country trip, he had plotted out where other ham radio operators were so connections could be made. While visiting, beeps of Morse Code sounded in the background. Barry was connecting with a ham radio operator with call sign W0JW out of Truru, Iowa. Although Morse Code is one way to communicate over ham radio, it’s not the only way. “There are lots of choices for communication,” Barry added, “like digital that works off a laptop (essentially coding). There are computer programs now that decode for you, and an app on my phone can tell me where other ham radio operators are.” During the visit with Barry, he was using digital mode and bouncing signals off the ionized trails of meteorites entering the atmosphere. “These are just tiny grains of sand and the trails they leave only last for a second or two. During that second or two I can send signals back and forth to people. It’s pretty cool,” shared Barry smiling. 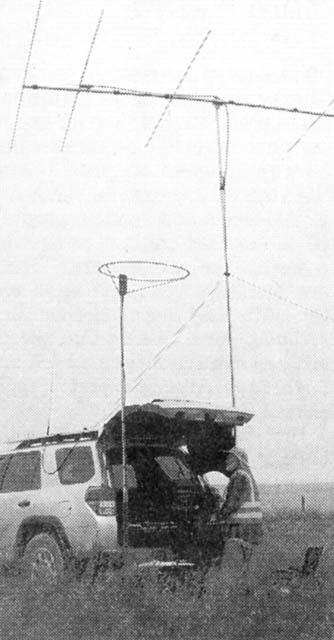 His set up, which is all in the back of his SUV and the large antennas dismantle and strap to the top, is an impressive $5-10,000 equipment set up, a big improvement from the simple ham radio he ran when he was 13. When Barry sets up to use his ham radio, it would be nearly impossible to miss him, well, unless he’s in one of those very remote locations he enjoys ham-ming from. This visit was not his first, nor his last with someone randomly coming up and asking what the heck he was doing. Which it sounds like he’s heard before. Barry, who’s call sign is K7BWH, took off on the rest of his journey across the US. “I’ve driven 2,500 miles so far, and I’m about half way,” Barry said. He guesstimated that it will take him three weeks to get to his destination, which happens to be where his daughter lives in North Carolina, but only four days to get back. 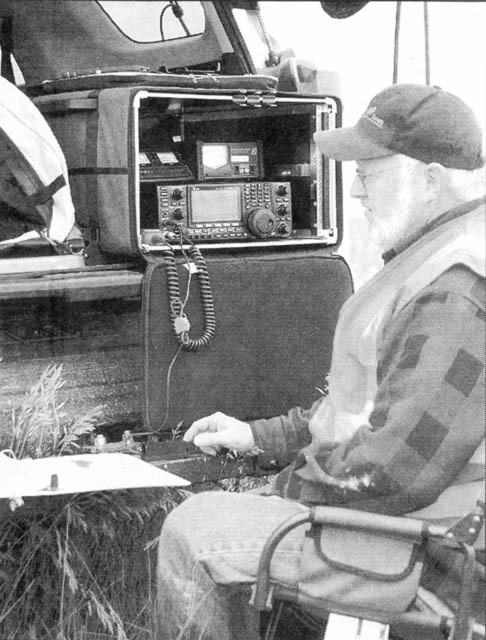 Barry’s hobby of ham radio is allowing him to take the scenic route, and communicating with a wide variety of like-minded ham radio operators along the way. Above, Barry Hansen communicates with other people via his ham radio set up in rural Keya Paha County. At right shows Barry’s equipment and set up that he uses to communicate over ham radio.